They have to pay 0.5% of their wages total into a "digital account" held by HMRC.They then "spend" these contributions on apprenticeship training delivered by registered providers. They can also get back up to 90% of the cost of training. The report says: "As part of the government's wider package of reforms to apprenticeships, groups of employers came together to write the new 'apprenticeship standards'. "Some used this opportunity to generate high-quality standards, but others appear to be simply rebadging low-quality, low-skill and often low-wage roles as 'apprenticeships' instead. "In 2013, the government said apprenticeships had to be skilled roles, requiring substantial and sustained training of at least 12 months, leading to full competency and should provide the apprentice with transferrable skills in an occupation.But a quick glance at the government's official apprenticeships website shows many high street firms advertising for apprentices in what appear to be unskilled roles.For example, KFC is advertising for an apprentice hospitality team member.The advert describes the apprenticeship as "a structured, learner and employer-focused development programme designed to create opportunities for lifelong knowledge, skills and behaviours".But the role is described as cooking "fries" and other products and serving customers front of house, or cooking and assembling KFC products, while maintaining clean, sanitary working conditions. 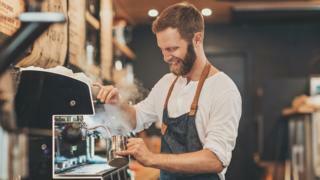 It says training is based around day-to-day duties, but will also involve one-to-one interactions with a specialised trainer every four to six weeks.KFC said the apprenticeship existed before the levy was introduced and met all the key standards, and that the firm paid more than the minimum apprenticeship rates. Coffee giant Starbucks is advertising for hospitality team member barista apprentices on the official website to make and serve coffee in its branches.But from online chat rooms it appears that people usually get trained for a couple of weeks before beginning work.Starbucks is yet to respond to the BBC's request for a comment.Tom Richmond, senior research fellow at Reform, said service sector apprenticeships could be of high quality, but many of these being approved did not fit the traditional or international definition of an apprenticeship.He compared British apprenticeship standards with those for the hospitality sector in Germany which, he said, cover a much broader range of skills and competencies.A Department for Education spokeswoman said it wanted to see people of all ages and backgrounds getting the excellent training they need to succeed in a wide range of jobs, and that this was why it was changing the apprenticeship system. She added: "Our reforms have fundamentally changed what apprenticeships are, as we made it a requirement that all apprenticeships must be real paid jobs lasting for a minimum of 12 months, with at least 20% off-the-job training. "Quality is at the heart of our reforms, and the apprenticeship levy is an important part of that - creating sustainable investment in skills training. "We're pleased to see an increase in people starting our new, higher-quality apprenticeship standards in a whole range of industries from nuclear to fashion, law, banking and defence. "These apprenticeships are designed by employers themselves, to give people and businesses the skills they really need."